Since August 6, the Vancouver Mural Festival has been taking place. It’s the city’s largest annual free public art celebration. So, spread over whole Vancouver, but especially in Mount Pleasant, there are a lot of new (and old) mural paintings to admire. But listen up! Saturday is the last day of this event. So, make sure you join the fun of a bike or walking tour, watch live painting or celebrate during the street party. If you don’t have time to see the colourful outdoor exhibition, you can find the official map from the Vancouver Mural Festival here. And if you didn’t have enough yet of all the rainbows and celebrating Pride Week, then you should stop by Burnaby on Saturday. 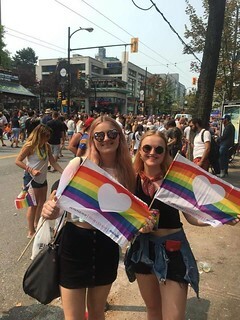 From 12pm until 4pm, there is the Burnaby Pride Street Party. Its first edition! Time to celebrate the diversity of the LGBTQ2S+ community in Burnaby. There will be live performances and food, as well as various kind of activities, such as face painting and storytelling. The fun can be found at Jubilee Avenue between Nelson Avenue and Imperial Street. After such an active day, I bet you’ll long for a quiet, more calm evening. Stargazing is always something beautiful to do. And if you postpone your relaxing evening to Sunday, you’ll even have the chance to see the Perseids Meteor Shower. Its peak is on the nights of August 11 and 12, and it should begin just after midnight in Vancouver. Let’s hope there are no clouds, since this would block the view on the show… And also, try to find a darker, non-light polluted spot in the city – like a park, for example. Just to make sure you see them well enough. By the way, the NASA recommends you to adjust your eyes to the darkness for about 45 minutes. Have a great weekend and see you at Crab Park for the Game Day! Monday. Time to look back on the weekend. Here we go! Friday. I started off the weekend with a relaxed evening at Sunset Beach. Many joined INTERNeX’ spontaneous ‘Pizza & Sunset’ event. Favourite action of the night involved throwing around wooden sticks. The game is called Kubb, which is a famous Swedish outdoor activity. Even people walking by the beach stopped, took pictures and asked for the rules. I’m sure we’re setting a new trend here with this game. The night passed by quickly with eating pizza, playing card games, chatting and watching the stunning sunset. When it got dark and a bit cooler, a few of us went to a pub on Davie Street for a pint (greets to our English guys) and some more card games. Saturday. Time to sleep in and take it easy this morning, before the next INTERNeX event of the weekend started. ‘Honda Celebration of Light’ was planned for the evening. Many people were expected to attend this great event, so we already headed to English Bay in the afternoon to reserve a good spot. Not the worst place to spend a hot day like Saturday, especially with good company. More and more people of our gang arrived and settled down. We bridged the time until the firework started with games, music and snacks. Then, it was finally time for the big show, which was prepared by a team from South Africa. They did a great job! It was beautiful to see the fireworks lightening the sky for nearly half an hour. On our way home, we accidentally walked along the Relish, so we took the chance and got ourselves a pint, of course. Sunday. Literally. To cool down a bit, I decided to visit the Metropolis shopping mall for a few hours. A great place to find everything you need, including 888 paper mache pandas. These are part of an exhibition that is traveling around the world. However, the weather was too nice to spend the entire day indoors. A great outdoor activity for hot days? Cycling! The place-to-be to do so is definitely Stanley Park. 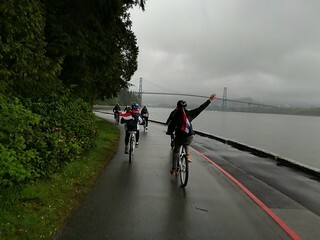 After a short stop at the bike rental, we got our one-speed-cruisers and biked relaxed around the seawall. I was, again, impressed by the beautiful nature so close to busy downtown. Amazing! The weekend ended with Sushi (no pint this time ;-)) and a lovely sunset on the way home. 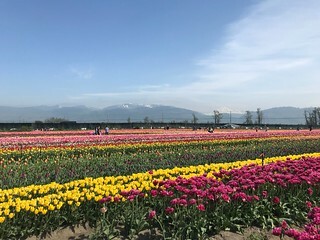 That’s how I spent another perfect weekend in Vancouver. I hope you had a good one as well! See you at Wednesday’s PuB NiGHT at The Lennox Pub. The past couple of days, it has been over 25 degrees Celsius in Vancouver. AKA: Summer is coming! Therefore, I thought it would be the perfect time to tell you about some great, affordable summer activities you can do during this time of year. Do you enjoy being on the water? Summer is the perfect season to go kayaking in False Creek! Groupon currently offers a 40% discount on two-hour single kayaks and a 44% discount on tandem kayaks. This means you can enjoy the beautiful view from the water, the calming sound of the waves and of course, improve your kayak skills, for only $24! The promotional value expires August 31st. Would you like to do something less standard? Go paddle boarding! You can do this at Kitsilano Beach as well as Granville Island. From Granville Island, you can paddle down to False Creek or to English Bay and enjoy the beautiful views you will pass by on your way. If you’re lucky, you might even see some seals! Groupon offers a discount for this activity as well: two hours of paddle boarding on a weekday will cost you $17 instead of $33 and two hours of paddle boarding on any day will cost you $21. Tip: bring a friend and rent a paddle board for two people. Why? Well, Groupon offers a 51% discount, meaning you and your friend only have to pay $33 in total! This promotional value expires September 5th. Not into water activities? No need to worry! If you enjoy movies and being surrounded by nature, I have the perfect activity for you: watch an outdoor movie at Stanley Park! Every Tuesday, between July 3rd and August 21st, you can wrap yourself in a warm blanket, eat popcorn and watch your favourite throwback movies, all while breathing in fresh air. The best part: it’s completely free! You can find the line-up here. If you would just like to do something simple; organize a barbecue with your friends and divide the preparation among the people who join. A fun day guaranteed! I hope the weather stays nice enough for you to do all these activities. If it does: don’t forget to wear sunscreen and take water with you! See you all tonight at the Lamplighter for PuB NiGHT! The weather in Vancouver keeps surprising me. Looking up the forecast beforehand doesn’t help in most cases, because it is changing so quickly here. But what to plan for the weekend then? Here is the deal: Look out of your window in the morning and choose one of these ideas! Sun is out! A great way to explore Vancouver is by bike. Most of you might not have a bike here, but renting one is affordable and easy. That is what I did last weekend and I really enjoyed it. There are many nice routes in and around the city. 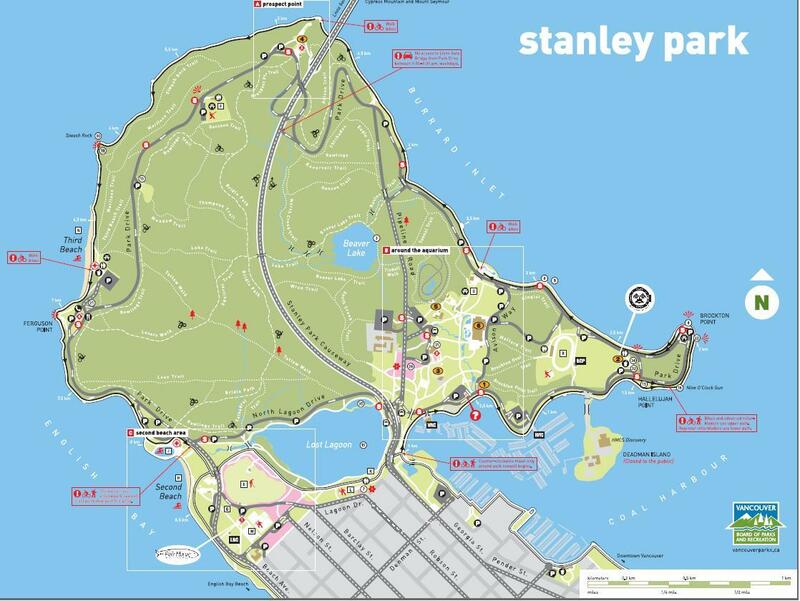 The one that is most famous is the route along the seawall in Stanley Park. You can ride all the way around the park or choose to shorten your path and ride through it. It is an easy route with a beautiful view that will take you about one hour of cycling. If you have more time, I would recommend another option. This route starts at English Bay. From there, you cycle to Sunset Beach all the way to False Creek. There are bike lanes everywhere and the signs are pretty clear. Then, you will pass by Science World and Canada Place and continue to Kitsilano. This route you will take about two hours if you take it easy. Kits Beach is the perfect place to enjoy a little break before heading back to downtown. You can either go back directly via Burrard Bridge or you ride back the same route. On this way, you will see many different faces of Vancouver: parks, beaches and the city. There are many beautiful photo spots, so take your time for some stops throughout the way. Cloudy and rainy! There are so many indoor activities in Vancouver, so it might be a difficult choice. Here are some of my favourites. A rather short, but awesome activity is visiting Fly Over Canada. As the name already says, you get the feeling of literally flying over the country. No worries, you are actually sitting the entire time. Beautiful Canadian landscapes combined with brand-new cinema technology create a pretty cool experience. If you want to be more active, what about jumping around for a bit? A trampoline park is a great place to spend some time on a rainy day. The Extreme Air Park has several locations in Vancouver. We just explored it last week with INTERNeX and everyone had a lot of fun. Another place-to-be for such days, is Granville Island. You can easily spend some time walking around in the indoor food market where you can buy lots of fresh fruits and meals. This weekend, the world celebrates Earth Day. As you surely have noticed already, Vancouver is full of nature too. So, let me tell you some fun facts about the green areas in this beautiful city. Have you ever heard about the Dude Chilling Park? That is the actual name of a park located in the Mount Pleasant area. It all started off as a prank when in 2012 the local artist Viktor Briestensky created a sign with this name on it. The Vancouver Park Board staff removed it, but an online petition with 1,800 signatures saved the sign eventually. Since 2014, it is back as a celebration of the unique community in the neighbourhood. This park is definitely worth a trip to take a cool picture in front of the sign. There are many parks spread over the entire city. The most famous one is also the biggest one. Exactly, Stanley Park. It is even bigger than Central Park in New York and offers beautiful sceneries. When walking around, you might see some of the many animals that are living in Stanley Park. All grey squirrels actually have American roots. In 1909, New York City gave eight pairs of grey squirrels to Vancouver, so all of the grey squirrels in Stanley Park today are descended from these American pairs. Another natural highlight in and especially around Vancouver is of course the ocean and its coastline. Wherever you plan a trip, you can choose diverse great spots near water. The total length of the coastline including the islands in British Columbia is 27,200 kilometres. Is that much? As a comparison, the length of the Earth at the equator is 40,075 kilometres, so not even twice that long. Pretty amazing! Wooaaah people! Have you seen the weather forecast for this weekend?! 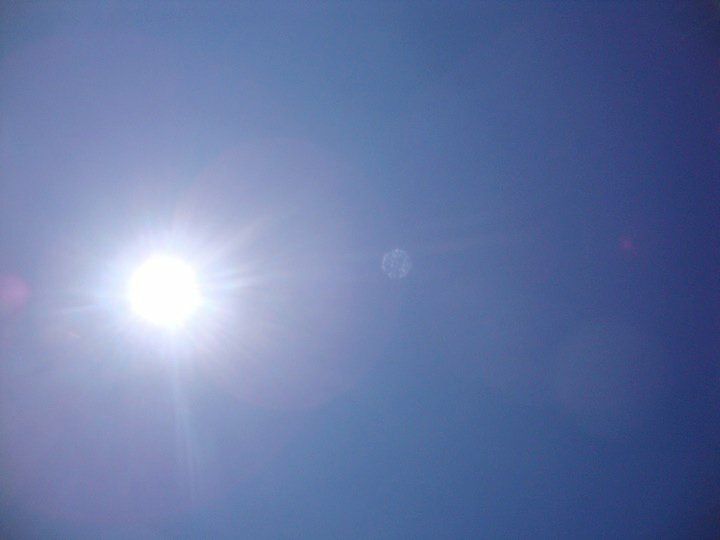 It is going to be full of sunshine and the temperatures are above 10 degrees. I think spring has finally sprung and summer is just around the corner. Well, almost. But for now, what can you do on these promising upcoming days? Let me give you a bunch of ideas. Are you a fan of exotic reptiles? Then you should go on Saturday or Sunday to the Richmond Nature Park where you can meet snakes, lizards and geckos during an exotic reptiles show. You can enjoy this fun from 11am until 4pm and admission is granted by donation. Oh, you don’t like exotic reptiles at all? Then maybe the Eastside Flea market is more your thing. It is a modern-day flea market which you can visit every weekend. More than 50 local vendors are selling different goods, from handmade craft items to vintage clothing, antiques, plants and more. Food trucks will satisfy your hunger, deejays will play and pinball machines or a pool table can be used for your entertainment. Sounds good? It’s located in the Ellis Building at 1024 Main Street, Vancouver and you can go on Saturday and Sunday from 11am until 5pm. The entry fee is $3 for a single day or $5 if you want to go on both days. 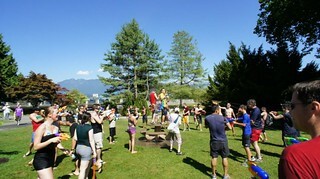 Or how about doing something active in sunny Vancouver? A day without rain is perfect for renting a bike and discovering the city or the park on two wheels. You can rent a bike for example at Spokes Bicycle Rentals, which is located at the entrance of Stanley Park. When you have rented a bike, you can cruise around the Stanley Park Seawall for 1-2 hours, take wonderful Instagram-worthy pictures and tank yourself up with some vitamin D.
No matter what you decide to do, I hope you all have a great weekend!